This July is truly a special month not only for us at SysAid, but for millions of people all over the world. In just a few days, we'll know which country will win the glory and honor of the World Cup title! Not only am I excited to see who'll take the final victory, but I'm also inspired by how it has united the SysAid community worldwide. I've overheard our support team here at SysAid talking a British customer through a backup process and then wishing him luck for the upcoming game against Germany. Shortly after that, a Brazilian customer called with a technical question and then began to excitedly discuss Friday's game against Holland. Not only have I realized that what we share in common is much greater than our differences, but I'm also reminded that what matters most - on the playing field and in the world of IT - is the drive towards excellence. Success not only lies in doing our best, but it's also about making the most of the resources we have. With the release of SysAid 7.0, I truly believe that you have the tools you need to achieve true IT excellence! To help you get the most out of SysAid 7.0 this month, our very own IT pro here at SysAid Tzahi Cohen shares his insights with you about our newest release. Learn about the five SysAid 7.0 features that have helped Tzahi work faster, reduce his workload, and provide the best possible support to all of us here at SysAid Technologies. Read how you can implement these features yourself and see the benefits instantly! In addition, I'm happy to announce that this July, there will be new improvements to our mobile application SysAid Helpdesk App! We originally released it as an iPhone application, and this month, it will be available as a Blackberry application as well! Even better, SysAid Helpdesk App will now include asset management capabilities and an improved look and feel for the service desk list. No matter who wins the World Cup, I know that for you, July will definitely be a month of IT success! Take Our Survey for the Chance to Win a $100 Amazon Gift Card! Poll: Which Team Do You Want to Win the World Cup? While we at SysAid develop software that's designed to help you resolve your IT challenges, the SysAid team confronts its own technical issues every day. Sometimes a computer crashes. Other times people just can't remember their passwords. (You know it only too well ...) For all of the IT challenges that we face, we at SysAid have our own IT heroes that keep us up, running, and productive no matter what! Tzahi Cohen, the IT Manager of SysAid Technologies and tech pro extraordinaire, uses SysAid as his tool of choice (naturally) for resolving the IT challenges that we face every day. With the release of SysAid 7.0, Tzahi has found five particular features that have helped him reduce his workload and accomplish his day-to-day tasks far more efficiently. "The new Online Users feature eliminates confusion and saves me a lot of time. I love how I can see who's logged in to the network at any given moment and send them broadcasts that pop up on their screens. Not only is this helpful for me - I don't need to pick up the phone or walk down the hall to see if someone's in the office - but it's also better for the SysAid team. If I've scheduled maintenance time that will only impact a certain number of people (the support team working the night shift, for example), I don't need to send out an email to the entire company. This kind of communication is better for everybody: those who are affected will know right away, and those who aren't affected don't need to worry about it. I've found that when people understand what's planned, they submit fewer service requests." 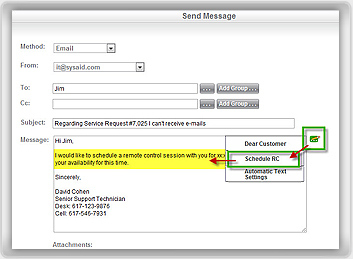 "We all have certain sentences we repeat over and over again in our emails to end-users. With new improvements to email templates, I can now insert pre-written responses anywhere in the email I'm writing with a single click of the mouse. If you can save even half a minute in every email you write, that really adds up at the end of the day!" "Escalation rules are one of the most important ways I can automate the IT processes here at SysAid Technologies, and with SysAid 7.0, I can now use the Expression Builder to make escalation rules for any and every scenario. The possibilities are limitless! With this kind of customization, I can make SysAid's escalation rules work for me and automate our processes as precisely as possible. I don't have to worry about different 'what if' situations because it's built directly into the program, and I can focus my energy on more important issues." "We all know how convenient it is to chat with end-users, and I was so happy when SysAid developed its own Chat Module in SysAid 6.5 that's specially designed for IT. 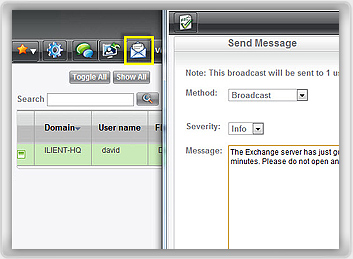 I'm even happier now with SysAid 7.0 because directly through the chat conversation, I can transfer data back and forth with my end-users without having to send an email or open a third-party file sharing service. 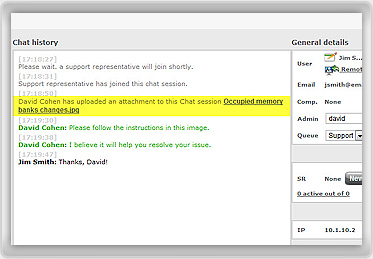 That's another 5-10 minutes that I've saved in every chat conversation that I have!" What's Your Favorite SysAid 7.0 Feature? If there's one thing that we've learned from SysAiders around the world, it's that the possibilities for using SysAid in new and unique ways are endless. While Tzahi has found his own ways to get the most out of SysAid 7.0's 130 new features, we want to learn about your own implementation! Our new Online Aid help files are integrated with the SysAid Community, so you can leave your own comments there about SysAid's different functionalities. Let other SysAiders know how you use SysAid, read what others are up to, and learn from the best! You Still Have a Chance to Win a $100 Amazon Gift Card! Just one week ago, we issued the 2010 SysAid Satisfaction Survey, and within the first day alone, we received almost 1,000 responses! Your feedback has already provided us with many important insights into how you feel about the SysAid experience and how we can continue to ensure that it meets all of your IT needs. We appreciate both the praise and suggestions for improvement: one of our core missions is to listen to what you have to say! 64.64% of SysAiders have already upgraded to SysAid 7.0! The SysAid Community is your most important resource! It's the first place that SysAiders turn to when solving a SysAid-related issue. Much of that is thanks to your meaningful and helpful contributions, so keep up the great work! In case you haven't had a chance yet to fill out the survey, there's still time for you to add your two cents. It will be open until July 13, so you have another week to take the satisfaction survey and tell us what you think about your experience with SysAid! Not only will you have the chance to influence the future of SysAid, but you'll also enter a drawing to win one of three $100 Amazon gift cards! Stay tuned for next month when we announce more results as well as the names of the three lucky winners. Thank you for your participation! Coming This Month: Improvements to iPhone App - and an App for Blackberry! Last month marked the exciting launch of SysAid Helpdesk App, SysAid's helpdesk application for your iPhone. 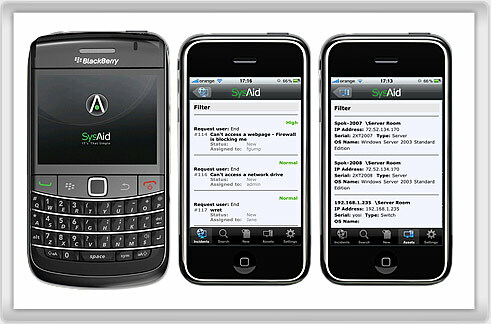 We know that all of you - Mac users and not - need to manage your helpdesk on the road, so we're happy to announce that this month, we'll be launching SysAid Helpdesk App as an application for your Blackberry! Asset management: You'll now be able to track your assets and inventory from anywhere in the world, anytime! We'll let you know as soon as these developments are available, so this July, keep your eye on the newsfeed of the SysAid Community. For all of you Android users, stay tuned - we're developing a SysAid Helpdesk App for you, too! For last month's Poll of the Month, we asked, "Do you mind providing support to your family and friends in your spare time?" The responses were unanimous: as annoying as it may be, providing support during your free time simply comes with the territory of being an IT pro. As SysAider XPD put it, "Hold on .. are you trying to say we have a choice in helping our family? When did this get implemented? :-)"
Working in the field of IT requires a patient and helpful attitude, so it's not surprising that 44% of SysAiders reported that they're always ready to help their friends and family - it's just in their nature! "I don't mind that at all .... as fixing computers, networking, tech support - over all whole IT ARENA is my passion and second nature.... However, they MUST provide me a small FEE - Very cold bottle of Cherry Coca-Cola... 😀 "
Another 53% of SysAiders reported that they'll help but it can definitely be irritating at times. Most annoying are the requests that come from so-called "friends" who only call you when they need your help! "It depends on if I have not talked to them in a long time, then they call me up to chat and mixed into the conversation 'ohhh btw im having this computer issue...' ...Right." "Sometimes you receive a call from an old friend who only calls you every time he has a computer problem.... coincidence??? mmmhhh... don't think so." SylvainG perhaps summed up the frustration of an IT pro best with a Dilbert comic strip posted in the Forum discussion thread. Check it out below as July's Joke of the Month - thanks for the contribution, SilvainG, and keep the humor coming! Building your own reports in the Manager Dashboard was always easy, but with the release of SysAid 7.0, you can create customized reports literally in a matter of seconds! The new Report Wizard walks you through a three-step process in which you choose the entity you want to measure, decide which fields to export into the report, and choose the filters you want to have available when you run the report. Build an unlimited number of customized reports with just a few clicks of the mouse. The Manager Dashboard has never been so quick and easy! 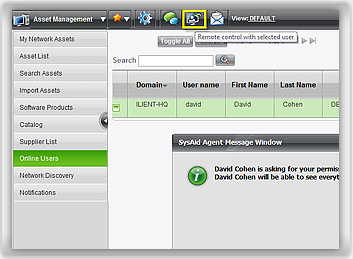 Please note: the Report Wizard is included in the Manager Dashboard, an advanced add-on module for SysAid Pro. For further information about the Manager Dashboard, contact us. To learn how you can get more out of SysAid's other features and functionalities, check out the other videos in the SysAid Product Tutorial series! Which Team Do You Want to Win the World Cup?